You’ll find our lovingly guided house in the middle of the inner city of Bingen but still in quiet location beneath the castle Klopp. It acquires it’s personal touch through the friendly service and it’s cozy, familiar atmosphere. We look forward to your visit. Let us pamper you! Cultivated hospitality has a home in the hotel. 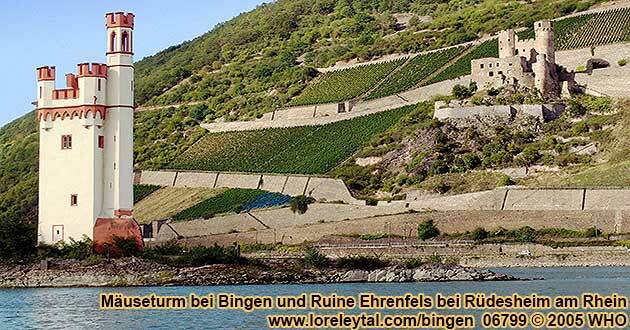 At the gate to the Middle Rhine Valley, the famous Binger Loch (Bingen hole), where the rivers Nahe and Rhine come together and are guarded by the guard Mauseturm (mouse tower), you’ll find an oasis of beauty, serenity and relaxation. In 1884 the house was originally a wine store of the company Augstein. Famous people, such as Dr. Augstein, attorney and the publisher of the well-known German magazine “Spiegel” Augstein, are direct descendants. In the course of the years, the building served for various purposes; around 1900 by the Jew Dr. Faist as a synagogue and later, starting from about 1936, by the company A. Racke as winery estate. The presents itself as a hotel since 1984. It is located in an absolute quiet location in the middle of the city in the Martinsgasschen, named after the patron saint of the people of Bingen. The castle Klopp thrones like a queen above this small alley and gives it the majestic flair, which characterizes our hotel. We look forward to your visit and wish you comfortable hours in our house. Hotel chef Ms. Manuela Heider and restaurant chef Steffen Wenselau. © 1997-2007 www.rheinhotel.de - www.rheinhotel.com - Without guarantee. All rights reserved. Subject to change.